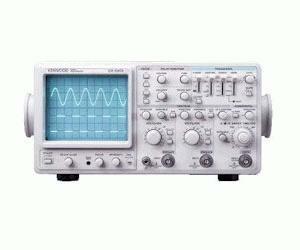 The CS-5400 Series are 3-channel oscilloscopes developed with concepts of high level design high accuracy and easy operation. The panel layout never diminishes the intuitive and high-speed response provide fatigue free operation even after long-hours of use. These models incorporating readout function (with CS-5400 / 5450) offer you parameter measurement and auto setup functions enabling to measure AC voltage (Vp-p) DC voltage frequency and period. All of these models are provided with full features including ±2% high-accuracy measurement delay sweep function automatic triggering and high intensity high-resolution CRT. The CS-5400 Series with high-performance will surely assist you in many kinds of field activities. CS-5400 series enable the display of CH3 input in addition to CH1 and CH2. These three input signals to CH1, CH2 and CH3 can be displayed at the same time as the main (A) sweep waveform. Furthermore, an alternated delay sweep function displayed as the delayed (B) sweep waveforms of each signal. The vertical axis sensitivity can be varied continuously from 1 mV/div. to 5 V/div. using the 1-2-5 step attenuator. The 1 mV/div. position is very useful to measure low-level and complicated signals. (Frequency response at 1 mV/div. and 2mV/div are DC to 20 MHz (-3 dB)).